Faced with growing pressure for faster provisioning times, easier-to-use platforms, and better visibility into digital and virtual assets, IT organizations are recognizing the value of incorporating a cloud management platform (CMP) into their broader cloud strategy. While there are clear benefits to implementing a CMP, it can be daunting to figure out which platform can properly manage your public, private, and hybrid resources. 451 Research data shows organizations will be using more than one cloud service which increases complexity with each additional cloud. 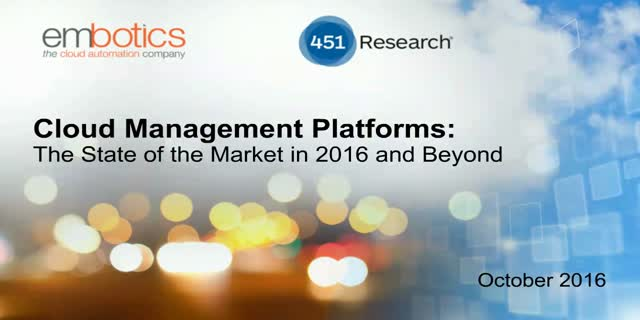 Join William Fellows, VP and cofounder of 451 Research, along with guest speaker Scott Davis, EVP & Chief Technology Officer at Embotics, as they dissect the key takeaways and findings of 451’s CMP market study of technology buyers at 166 US enterprise. This webinar will examine the growing need for a CMP in today's market, factors to consider when deciding to move to a CMP, and how to ensure successful deployment in your organization.